As black bears in New Jersey continue to adapt to living in closer proximity to people and human development, they learn to take advantage of human-derived food sources. The Division of Fish and Wildlife has been conducting an intensive public education campaign to teach residents, hikers, anglers and campers about how to safely coexist with black bears and minimize negative interactions. Efforts include presentations to school children, civic organizations, communities and other groups, as well as the development of an educational video, public service announcements, brochures, signs and other educational materials. The black bear education program was awarded a national award for excellence in 1999. 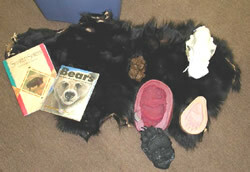 Produces and distributes thousands of pieces of educational material to teach residents how to coexist with black bears. Presents hundreds of educational black bear seminars to tens of thousands of residents. Airs radio and television Public Service Announcements concerning bear behavior. Handles over 1,200 phone calls to provide advice and technical assistance to residents about black bears. Trains law enforcement officers to respond to black bear incidents. The Black Bear Education Trunk is a great resource for educators to use when teaching students grades K-12 about black bears. It includes an activity guide for educators, a bear hide, skull, casts of bear prints and lots of other hands-on materials. It is available for pick-up at the Pequest Trout Hatchery, located in Oxford, NJ. 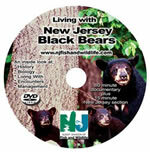 Children should visit the following link to learn more about living with black bears in New Jersey and to find fun games about New Jersey's wildlife.